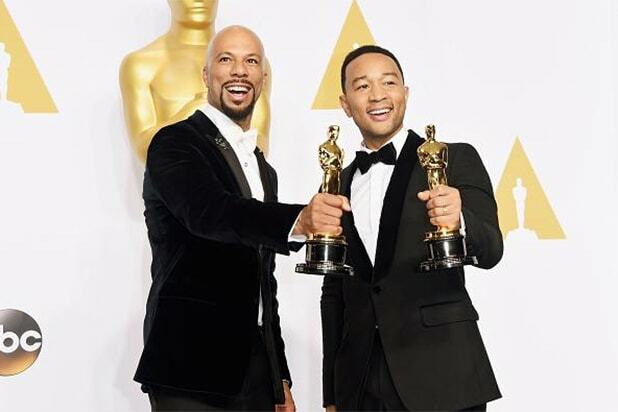 Musicians Common and John Legend defended their politics-heavy speech backstage after winning the Oscar for Best Original Song on Sunday, though they stopped short of calling out other artists who shy away from being so outspoken. On stage, Legend directly referenced current political issues he feels mirrored the themes of “Selma,” the Martin Luther King, Jr. biopic he and Common wrote the Oscar-winning song “Glory” for. Backstage, Common fielded a question on how he feels about other artists who choose not to use their fame as a platform to discuss issues they care about. 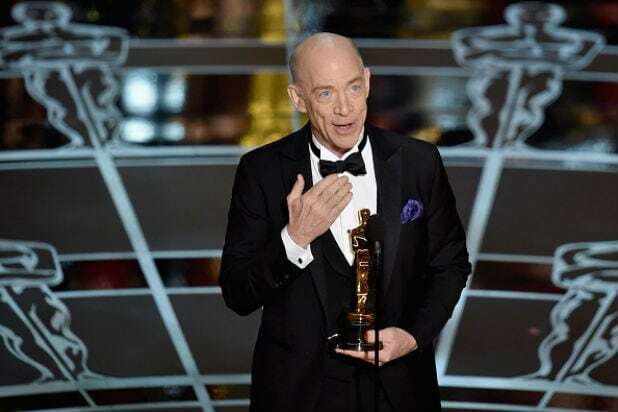 JK Simmons: Best Supporting Actor - "Whiplash"
Frances Hannon and Mark Coulier: Best Makeup and Hairstyling - "The Grand Budapest Hotel"
Mat Kirkby and James Lucas: Best Live Action Short - "The Phone Call"
Ellen Goosenberg and Dana Perry: Best Documentary Short - "Crisis Hotline: Veterans Press 1"
Craig Mann, Ben Wilkins and Thomas Curley: Best Sound Mixing - "Whiplash"
Alan Robert Murray and Bub Asman: Best Sound Editing - "American Sniper"
Patricia Arquette: Best Supporting Actress - "Boyhood"
Paul Franklin, Andrew Lockley, Ian Hunter and Scott Fisher: Best Visual Effects - "Interstellar"
Patrick Osborne and Kristina Reed: Best Animated Short - "Feast"
Don Hall, Chris Williams and Roy Conli: Best Animated Feature Film - "Big Hero 6"
Adam Stockhausen (Production Design), Anna Pinnock (Set Decoration): Best Production Design - "The Grand Budapest Hotel"
Emmanuel Lubezki: Best Cinematography - "Birdman"
Tom Cross: Best Editing - "Whiplash"
Laura Poitras, Mathilde Bonnefoy and Dirk Wilutzky: Best Documentary Feature - "Citizenfour"
John Stephens (John Legend) and Lonnie Lynn (Common): Best Original Song - "Selma"
Alexandre Desplat: Best Original Score - "The Grand Budapest Hotel"
Armando Bo, Alexander Dinelaris Jr., Nicolas Giacobone, Alejandro G. Inarritu: Best Original Screenplay - "Birdman"
Graham Moore: Best Adapted Screenplay - "The Imitation Game"
Alejandro G. Inarritu: Best Director - "Birdman"
Eddie Redmayne: Best Actor - "The Theory of Everything"
Julianne Moore: Best Actress - "Still Alice"